Ok, so here’s the skinny on the 2016 C-Market up till now. As I sit at home and ponder this coffee market report, I am currently sipping our Sumatra Lintong Tiger. I often wonder how much hard work these farmers go through to bring us so much joy in the cup. While the market has gone down to below $1.15, differentials have moved up to compensate. 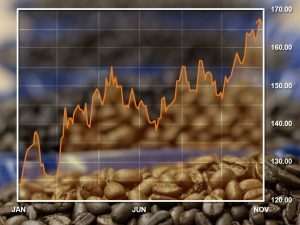 The new norm is flat priced coffee, as differentials can’t keep up with the market drops. Great coffees are commanding high flat prices, and hopefully this will keep all our farmers that we buy from prosperous and their businesses thriving. Colombia mitaca (fly crop) is flat with little rainfall early in the season, and the hope that La Nina does not damage the mitaca with heavy rains in the middle of the cycle. Vietnam reports are not bad, but they say that if the coffee market drops below $1.00 they will hold on to their crop and not sell coffee. The reality is they need cash, and in our opinion they will sell. With most currencies down except for the USD we will see flat to modest gains differently. Rwanda Hingakawa Women’s Co-op – Just Arrived!! We are seeing a lot of action and new things going on. We are on the road to finding you all best coffees in 2016 and that is what Vournas Coffee Trading is all about. There’s always an open invitation waiting for you to join us at our cupping table in Westlake Village. To view a full listing of our coffees please visit our coffee offerings page. ← Central American Specialty Coffee: When Does New Crop Ship?